To reset the treatment is still at Normal, because it tells me Windows phone could still be in use. Any errors as small as a mobile phone that can interfare you in use a smart phone Windows. 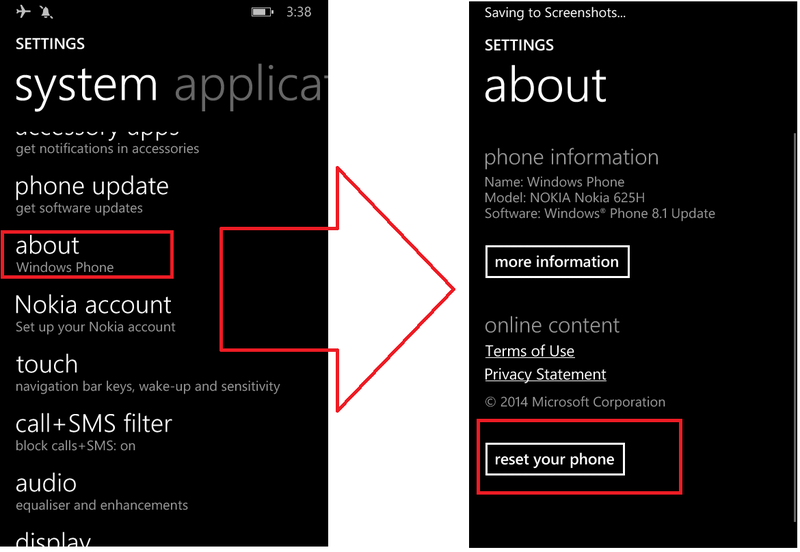 Here's how: go to the settings menu> about (Windows phone)>, below it there is "Reset phone" button. With options in it "erase sd card too". Furthermore, the select button "YES" or "NO". 2. A combinations of buttons: Power, Volume up, Volume down. This reset only treatment in use in when your phone cannot enter the menu Windows phone or Blank screen, which appears on the screen only the logo of Nokia. turn off your mobile phone. In OFF, press the power button and down (simultaneously and on hold) will be vibrating. Then release the finger on the Power button. So, the remaining buttons press the Volume Down Button just press. After waiting, it will feel more vibration on the phone (still pressing the Volume down). Continue in this way with the appearance of the image "exclamation point/ ! " on the LCD screen smart phone Windows. With images turned on, can be directly executed by pressing a combination of keys alternately (rather than in the press at the same time and not on hold): Volume up, Volume down, power, Volume down, Volume up. If method 1 and 2 fail or can not do, can do with the way the last alternative (reinstall software). Can use the software Nokia Care Suite Store 5.4.119.1432, and search the files extention "cfg" (UserGroupConfiguratio. cfg) in google or bing search engine. This file is in use to login as admin without a login, because without login you can't do in Flash complete. Please note that this requires the Software Nokia dev login only. If you register, it is certainly in decline. You are on the website page WINDOWS MOBILE PHONE - setting and Upgrade. Reset Lumia With the link URL http://hand-uk.blogspot.com/2015/03/reset-lumia.html for this articles, you can bookmark or share to any. Our expectation that Windows smart phone users, can understand and know about OS Windows phone. Reset Lumia Is a link for you, How to use the pure smart phone.